The Indigenous People of Biafra (IPOB) has said that Port Harcourt formerly referred to as ‘Igweocha’ is now the official base of Biafra. 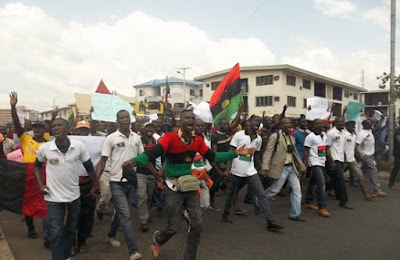 In a new statement sent to NAIJ.com by its spokesperson Powerful Emma, the IPOB said, the leadership of the group commends the unity among Biafra agitators across the world. Emma said the fact that the people of Ikwerre and other communities in the South-South and South-East region are concerned in the agitation for Biafra is an advantage in the quest for the freedom of Biafra. “More so, Igweocha is considered by many now to be the unofficial power base of IPOB led Biafra resurgence. We also hope that Uyo, Oron, Warri, Ogoja and Yenegoa will be the centre for the struggle in no distant future,” Emma said.